Doctors who are practising under governmental organisations are mostly eligible for various allowances along with their basic pay. One such allowance is Non – Practising Allowance that is given to most of the medical officials working under central government, railways or any other governmental organisations. It is said to be equivalent to the other basic allowances like Dearness Allowance, Travel allowance and also pension plans. The NPA is calculated on the basis of their basic pay. Under 7th pay commission the rate of the non – practising allowances is recommended to be reduced to 20% of the basic pay. The detail story about NPA is as follows. Non – practising allowance is given to the medical officers who are working under central government health centres, railways or in other departments of union government. A medical officer who is not interested in practising from home can ask for such allowance. This allowance is considered as equivalent to the Dearness Allowance or Housing Rent Allowance. The amount of non – practising allowance is calculated on the basis of basic pay plus grade pay. The HRA is calculated on the basis of basic pay plus NPA. On the other the pension is also calculated on the basis of NPA. NPA is also provided to the medical officers who are in leave for higher study. To get the non – practising allowance, a medical officer must have a minimum medical degree certification. If the candidate wants to pursuit higher studies, he /she can grant for NPA during their study leave. Non – practising allowance is calculated on the basis of the basic pay of a medical officer. The basic pay includes the grade pay as well. After 6th pay commission the NPA was set at 25% of the basic pay. Non – practising allowance is not a regular allowance like HRA, DA or TA. To receive this allowance one needs to fulfil some criteria. The main criterion to receive the NPA is to have a minimum medical degree from a recognised organisation. Also as per the rules whoever is receiving the NPA shall not be involved in any private practice during their service, leave or after retirement. The NPA is considered to be an important part while calculating HRA and also Pension after the retirement. 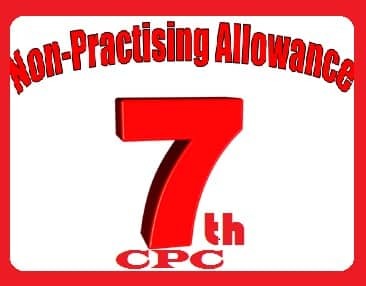 Of course the non – practising allowance is not for all. To receive this allowance, candidate must apply to the organisation separately. As mentioned the non – practising allowance is given to specific medical officers. The format of this allowance is bit different from the other allowances. In other allowances or perks candidates do not need to apply separately or fulfil any educational qualifications. But in case of NPA candidate must possess a minimum medical degree from a recognised organisation. During the service or after retirement medical officers who are drawing NPA cannot be involved in medical practices. The allowance is given to the eligible candidates on monthly basis. For the officers who are in study leave can receive the allowance on monthly basis or quarterly. NPA is given to the medical officers and also veterinary doctors who are working under central health centres or government owned veterinary hospitals. The rate at which the doctors get the non – practising allowance is 25% (as per the 6th pay commission). On the other, the contractual vet doctors are not eligible to receive NPA unlike other contractual doctors. In recent times, the association of vet doctors has requested to the government to grant NPA for the contractual vet doctors and also grant study leave for the same. Medical officers who have minimum medical degree and are receiving non – practising allowance can also get the same during their study leave. If the doctor wants to pursuit higher studies or post graduation can get up to 2 years of study leave and can draw the NPA from the Indian government. But while drawing so, he / she cannot practice privately. On the other for the vet doctors the scene is little bit different. In case of a veterinary doctor, study leave does not yield any NPA for them. As per the 6th pay commission the NPA rate was 25% of the basic pay. After 7th pay commission, the rate is been reduced to 20%. Though the doctor’s association has requested to increase the rate at 40%, but the pay commission was made their decision already.